Angel Pierterson and I met at her house. She has a gift in photography. Angel had been a photographer for quite some time. When she was asked how long she had been a photographer, she said, "Geeze, eight years give or take..? Quite a while. But it's been off and on, I have droughts when the muse doesn't visit like any artist." 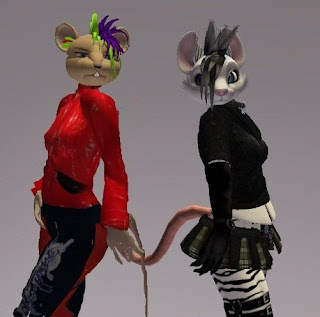 Angel has a website to show her work on Second Life. It does contain adult material and people who wanted to see her work would not be able to see it without signing in first. 99 percents of Angel's work is furry related. Angel's website is at https://dj-angel.sofurry.com/. She does have this to say about photography: "I mean I average about 20 bad shots for every good shot in there and that's a great ratio." When Angel was asked how long she think she'd continue doing photography, she said, "Until I either pass on or until they shut down Second Life. whichever comes first. It's something I do enjoy doing even if it's off and on." "I release my art under a non commercial creative commmons. Meaning if you don't sell it do what you want with it. As long as I get my credit." said Angel. "Truth is.. you really don't feel like you've made it until someone tries to steal your art... Not that I've had that happen..Angel did make a good point when she said, "As long as you note that you can't steal it with the permissions as long as you don't make money on it and credit me for it." Angel does portraiture. She predates flexies/sculpties/the marketplace/rolling restarts. She loves helping people out. She dislikes empty profile spaces. She has a picture to show how far avatars have came over the years: https://www.sofurry.com/view/459236 . Angel said that the photoshop is crappy but it gets the point across. "For me it's usually afternoons, because I really don't wake up quick in the morning. As the quip goes, 'I hate waking up before the crack of noon.'" said Angel. She said this about her time on Second Life: "You can be anything you want in SL and pretty much my entire eleven plus years here has been exploring my fantasies. And that's the amazing thing about SL." Angel often goes out into non furry areas. She will gladly schedule time with humans and other non-furries. Her circle is mostly the furred ones. That's what she generally works with. The prices are negotitable as far as work goes, but she doesn't want her hobby to become a job. When Angel was asked about her muses, she thought about it for a bit before answering. "Music, my friends, my fantasies. I mean I'll let you and your readers on a secret of mine..." said Angel. "I'm not a cheetah IRL.. Shocking, I know, right?"